What a pass! 99 yard TD pass for the Vikings! Watching Sunday Night Football... Minnesota Vikings vs. Chicago Bears! Go Vikes! is back home in SF after a great trip to MN for Thanksgiving. Even got to see some snow this AM before flying home. http://ping.fm/p/2xWYq - Lunch at famous daves in Bloomington mn. Heading over to the mall of America in a few minutes. Think it will be busy? Mmmm bloated from great dinner. Tired from day of Wii. Thankful for Catrina family friends job and health. SFO airport is really dead and quiet this afternoon. Zero wait at security. Now back to my bloody Mary. All the "S"s are now done, pretty much packed. Cats sense that something is up. Maybe it's the suitcases. One of the four morning "S"s done, three more to go, then I will start packing. So much to do before flying to MN tomorrow. In the office 2 days this week and easily have 7 days worth of work... priorities! The cats are all stocked up; cat litter, dry food, wet food and treats. The new Hinder album Take It To The Limit is excellent. Honestly, it is the only thing I have listened to for the last 5 days. When a cat wants you up at 5am, you will wake up. http://ping.fm/p/7jvnO - Tv show Chuck being in hotel lobby today. 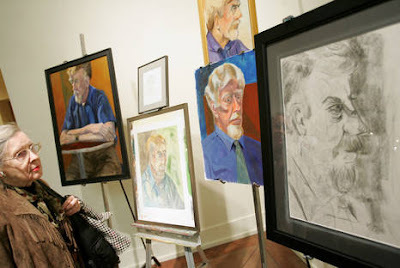 The public memorial for Milton Lindgren and Eric Hendricks at the Indianapolis Art Center in Indianapolis was filled with paintings and drawings that Lindgren modeled for.. VIEW SLIDESHOW. Busy day of meetings at Webmaster Access, getting ready to head up to Universal City Walk for dinner. Been up for an since 5:30am catching up on a days worth of email and planning out today's schedule at Webmaster Access. Been up for an hour already catching up on a days worth of email and planning out today's schedule at Webmaster Access. Thursday, November 20, 2008, 5:30 p.m. The Indianapolis Art Center and Indiana Equality invite the public to an evening of remembrance for Milton Lindgren and Eric Hendricks. The community is invited to a memorial for Milton Lindgren and Eric Hendricks who were murdered in their home October 20, 2008. Lindgren was 70; Hendricks, confined to a wheelchair, was 73. They had been subject to vandalism and anti gay statements prior to their violent deaths. Lindgren, considered a member of the Art Center family, had been a student since 1993 and a model. He and Hendricks are missed by hundreds of students, faculty and staff, in addition to friends and family. Artworks created by faculty and students of Lindgren will be displayed for one night only for the memorial service. Speakers for approx. 25 minutes. Attendees are invited to view artworks created by faculty and staff of Milton Lindgren in the Churchman-Fehsenfeld Gallery. Artworks will be displayed this one night only. *This painting was recently exhibited (prior to Lindgren’s passing) in a solo exhibition by Siskind at the Art Center titled, “A Cup in Time,” August 29 – October 5, 2008. Siskind is a regionally recognized artist with work in the permanent collections of four Indiana art museums, in addition to being a recipient of the 2002-03 Creative Renewal Grant from the Arts Council of Indianapolis. Indianapolis Art Center is a not-for-profit community arts organization that makes art accessible to all people and enhances people's lives through art. Located in the Broad Ripple Village Cultural District and along the White River, the Indianapolis Art Center is the place to make art, see art and talk about art. For more information visit www.IndplsArtCenter.org or call (317) 255-2464. The mission of Indiana Equality is to end discrimination based on sexual orientation and gender identity in Indiana. IE seeks such equality by facilitating and coordinating the efforts of the LGBT and allied community that are directed to research, education, and community mobilization. For more information, see our website at www.IndianaEquality.org. Finally eating dinner, but really enjoyed drinks with Twitters and Facebookers at Webmaster Access. Listen for me on the SIN 2.0 podcast. Exhausted from a day of meetings in LA but now at the Sheraton resting up before drinks in lobby bar at 8pm. See you there! Packing and then off to LA tomorrow AM, staying at Sheraton Universal. Drinks in lobby bar at 8pm Wed.
Twitters & Facebookers attending Webmaster Access LA let's meet for drinks in hotel lobby bar Wed 8pm. We would like to invite you to a very special evening of recognition. Recently, we lost a dear friend, student and model of the Art Center due to very tragic circumstance. Our beloved Milton Lindgren was killed a few short weeks ago, along with his partner, Eric Hendricks, in their home. we will be honoring Miltons’ memory with an exhibition of paintings and drawings of Milton, made over the last few years by Art Center faculty and students. We will also have a performance by the Indy Mens chorus, and several speakers to celebrate the spirit of this kind and gentle man. If you are an Instructor or student that has a painting or drawing of Milton that you would like to share with everyone this evening, please drop off your artwork (with your name and phone number on the back) to the Exhibitions Dept by Wednesday, November 19th. If you have any questions or comments, please feel free to call Mary Lee Pappas (x223) or myself (x222). Information on the Indianapolis Art Center, who are organzing this memorial, can be found at www.IndplsArtCenter.org. A man wanted on a warrant in connection with a double slaying in Indianapolis has been arrested in California, according to the Indianapolis Metropolitan Police Department. Michael Brown, 56, was arrested Saturday in San Diego, according to a statement from Sgt. Paul Thompson, Police Department spokesman. Brown was wanted in the deaths of Eric Hendricks, 73, and Milton Lindgren, 70. The men were found dead Oct. 20 in bedrooms of the house they shared in the 9100 block of Middlebury Way, on the Southwestside near the Hendricks County line. Brown was originally mentioned by police as a friend of the victims who had found the bodies. In a printed police report, officers said Brown told them he had not heard from Hendricks and Lindgren for a week or two, and he went to their residence. There, according to the statement, Brown told officers he found a rear window was partly open. The report said Brown and another man told police they entered the house through that window and found the victims' bodies inside. Court records stated that two murder charges against Brown were filed Thursday and a warrant for his arrest was issued. Police have not said what led to the deaths. Call Star reporter Kevin O'Neal at (317) 444-2760.
is watching the BBC series The Last Enemy with Catrina. Another near 80 degree day in San Francisco! I still love new music Tuesdays last night I bought Cheap Trick Budokan 30th Anniversary DVD/CD. Had a very eventful Tuesday at work, but ended the day listening to the new Shiny Toy Guns. I really like the new album Season of Poison. Just found William Shatner's entire Tekwar series online. I remember it as being cool, let's see if it holds up. Just walked down to the Farmer's Market in my new track suit! It's Saturday and what does that mean? Clean the house today! If you want to get a man's attention just say "so, my period hasn't started yet..."
Is trying to mentally prepare for todays website build. Not happening. Based on CNN projection, congratulations to Barack Obama! Change has begun! I just spent one hour making a difference, I voted. http://ping.fm/p/StAXZ - The line to vote in North Beach. Today is the day, please VOTE! I'm shopping with Catrina and she keeps asking, that's cute right. Does she forget who she is shopping with? Apparently the 3 cats did not realize that the clock changed this morning. They woke us up at 5am, or in their minds 6am. http://ping.fm/p/WxwYf - This fresh corn from the farmers market, the worm is still alive. Is back from the Farmers Market, with some Candy Salmon and Salmon Sticks. Is happy to be home with Catrina after an exhausting trip and emotion filled funeral. You never like to see your mother cry.